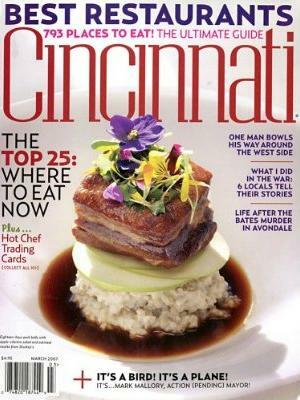 Cincinnati Magazine is a regional magazine covering the area of Cincinnati, Ohio. Cincinnati Magazine is the best way to stay on top of all the important people, places, events, and issues in this exciting city. Each issue of Cincinnati Magazine is packed with everything to do and see in this vibrant city, with features on business, the home, travel, and fashion. You'll get the best of the city's arts, dining, and entertainment listings, as well as the indispensable Menu Guide, published each December.